[Oh no - I see Little Italy is closed and shuttered (see picture below). Here, for the memory, is my review from 2017]. I remember a time, and perhaps you do too, when the Grainger Market was far from being a gastronaut’s delight. Now it’s an essential destination on Newcastle’s foodie map. 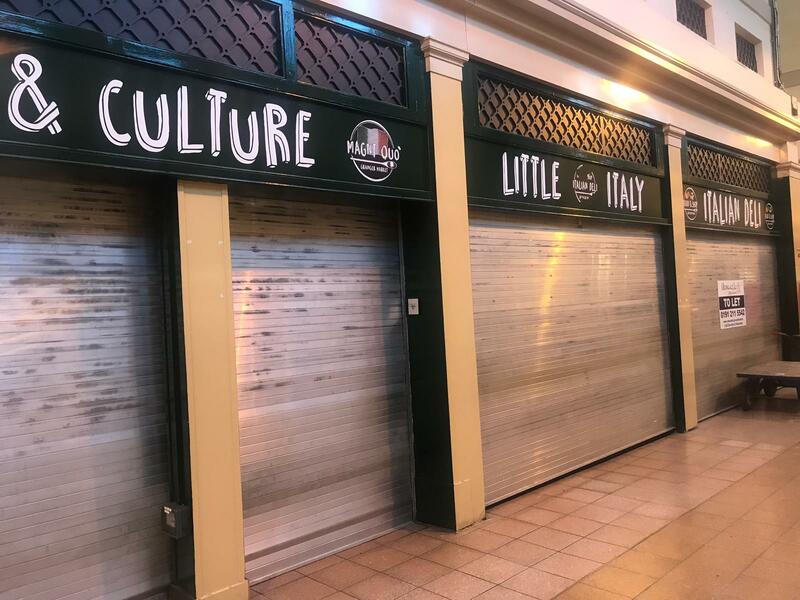 When Mmm… opened in 2008, selling posh olive oils and precociously tasty condiments, I feared that they were too far ahead of the curve and would never last. As it turns out, I was bang wrong and they were in fact just the vanguard of a whole brigade of food start-ups that would take advantage of the central location and reasonable rents offered by this fabulous Regency-era covered market. 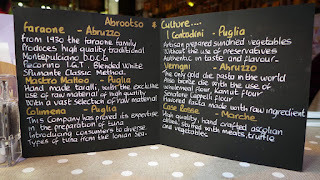 A couple of years ago I reviewed many of the excellent street-food vendors who have made the place their home, but recently I felt had to return just to check out what I reckon is probably the market’s first fully fledged restaurant - plates, wine, proper service, that sort of thing. 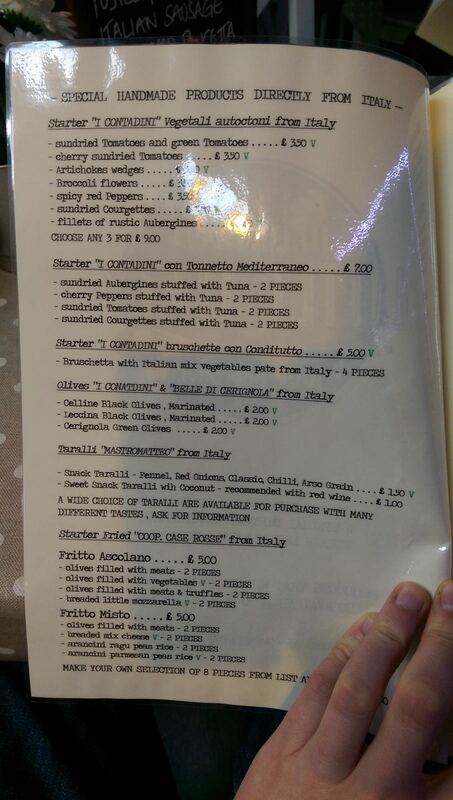 I’d heard that simple Italian food was being done very well. I’d heard right. 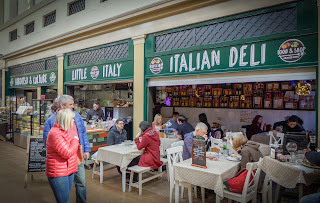 Little Italy - and it is aptly named, indeed it’s so diminutive I advise booking if you want to be sure of a table - is brought to you by the same crew who sling utility pizza slices for tiny prices over on Alley Four. Their cooking is good, but it is their shopping that makes eating here such fun. 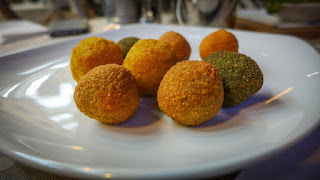 We tried a few fried olives, sourced from Ascoli Piceno in the north-easterly Marche region of Italy. Supplied by the Case Rosse farm cooperative, these were gloriously bitter-sweet, meaty, yielding and crunchily fried to the shade of tan a week on the beaches at Numana will bestow. Filled variously with pork and beef paste, truffles and vegetables, these are bar snacks fit for Jupiter himself. Some dainty deep-fried orbs of molten mozzarella were also pretty addictive. 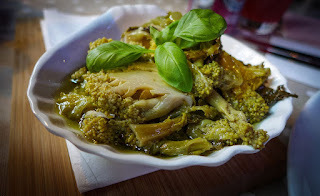 A small dish of what the menu described as broccoli flowers, but I suspect would be more accurately labelled cime di rapa, involved no more skill than the opening of a jar and the adornment of a sprig of basil. But what a jar! These spindly emerald jewels of brassica are supplied by I Contadini in Puglia, Italy’s heel, and were like a vivid blast of sunshine, preserved in olive oil and a little lemon and vinegar. Our main courses involved some actual cooking. An large coil of Italian sausage with, I think, just a faint waft of fennel about it, was given tannic heft from having been cooked in Montepulciano. 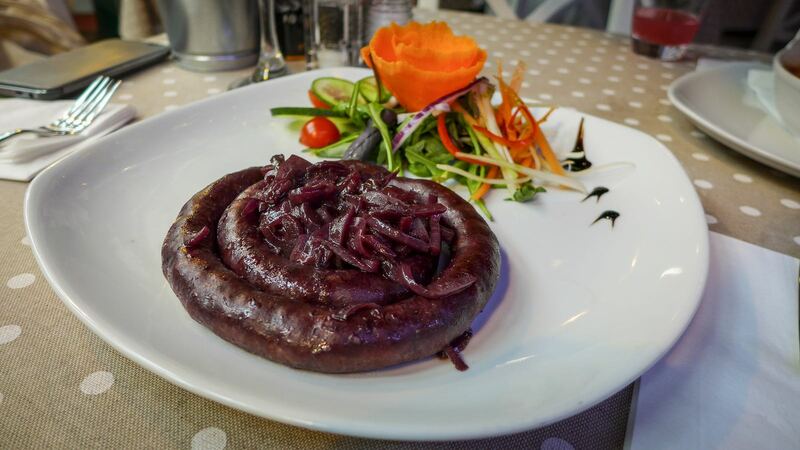 It came with tangy red onions and a rather pointless salad that made me wish I’d ordered a side of rosemary potatoes. Learn from my error. 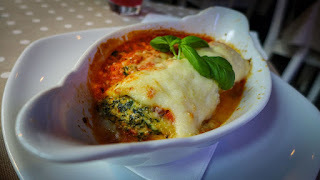 Mrs Diner’s cannelloni was a homely delight, a molten mass of bechamel, spinach, a fine tomato sauce and cheeses. The egg pasta was so light that it took me a while to be sure it wasn’t crespelle. At least that was the excuse I gave Mrs Diner for stealing a third bite of her dish. A plateful can be all yours for just £5.50 – a fabulous midweek lunch if you’re lucky enough to work nearby. I loved the fact that each forkful we tried contained the flavour-memories of Italian holidays, yet there we were, people-watching from a spot where I’m pretty sure Greggs used to be. All around us the market busied itself, like a Geordie version of some Bruegel painting. I loved that just a few quid bought me a glass of a Falanghina-graped white to accompany all this, heady with the fragrance of sun-blasted hedgerows, while just a few yards away the market bin-cart trundled lazily past. Incongruous? Maybe. Delicious? Certainly. We had to try their desserts. 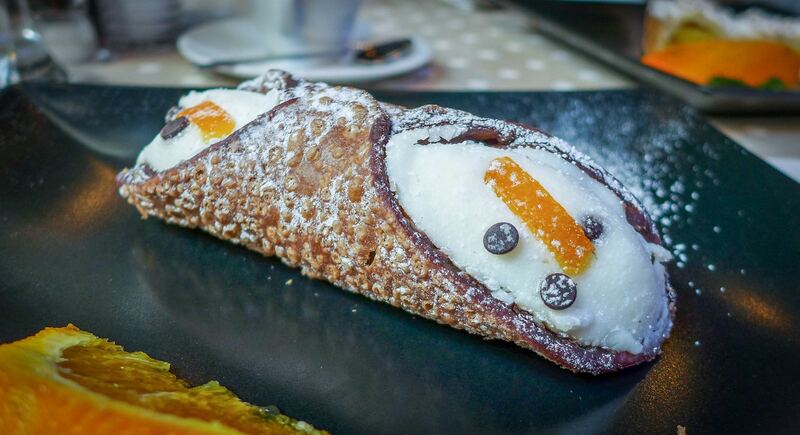 A cannoli (or cannolo, if we aren’t to incur the wrath of the plural police) and a wodge of lemon and pine-nut tart were merely pleasant. The ricotta filling of the former needed something to pep it up, and it had been in contact with its fried pastry shell long enough to lose its crisp. 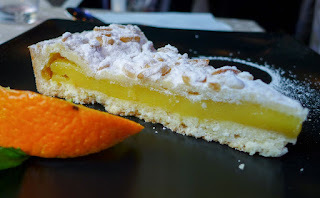 The lemon filling in the tart also lacked a little verve, and the pastry was a touch undercooked. It reminded me a little of Torta della Nonna, my favourite Italian dessert, but not enough. 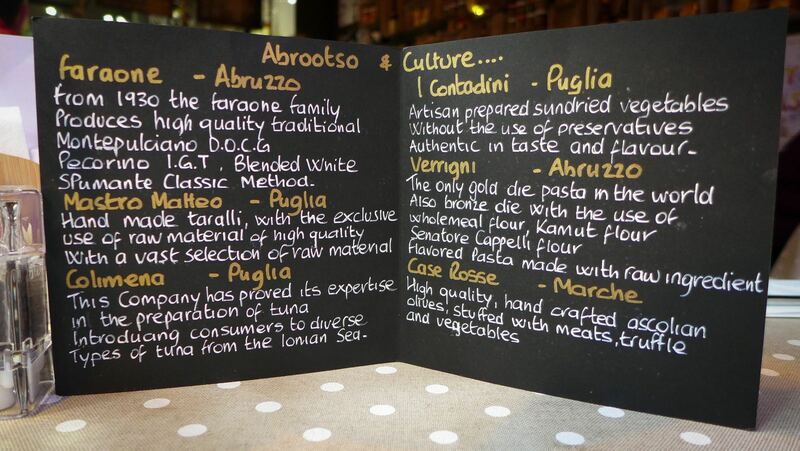 An espresso was very good, and only cost a quid, which is as it should be. Service was brisk but friendly and caring, which is also as it should be. Although lacking a triumphant finale, this was still a hugely enjoyable lunch, coming in at a very reasonable thirty quid for three courses, including drinks, for the two of us. It only gets three stars for food because the cooking was basic (see the ratings rules on this site), but in this case it’s really not a criticism. 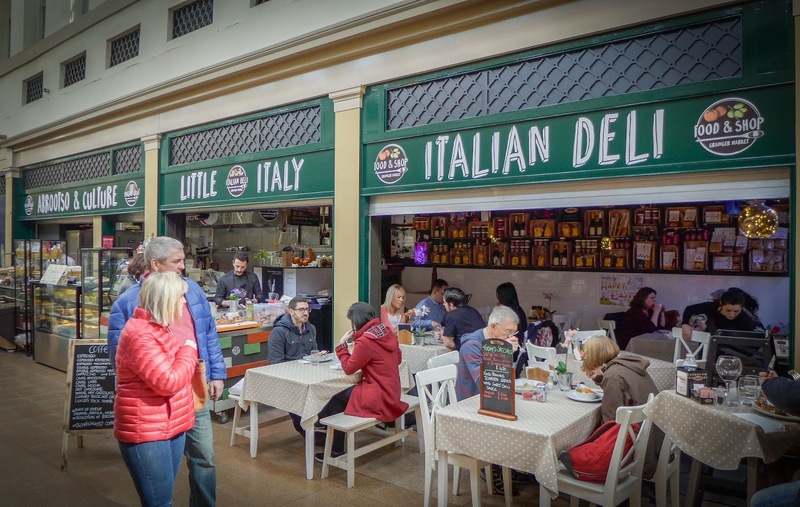 Little Italy is sourcing high quality ingredients from around the old country and serving them up without fuss or fanfare. 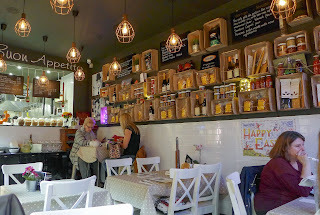 I’ll be back, lots of times (the menu is large and most of it is tempting) and I suspect lots of others will too. If you fancy a little dolce vita in your own home, you can buy much of what they serve by the jar or packet – it’s a really useful deli. Or, like me, you can squeeze into a table on Alley One, watch the thronging crowds do their thing, and enjoy the fact that the food in this fabulous old market seems to get better and better every year. It’s just a shame it’s only open until 5.30pm.